Printing Methodologies | Data Graphics Inc. Printing Methodologies | Data Graphics Inc.
Data Graphics is one of the most versatile and highly recognized printers in the nation. 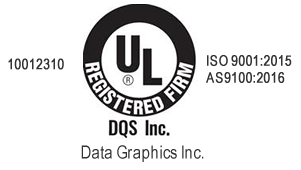 We have won numerous awards, and are currently certified as being ITAR, AS 9100, ISO 9001 and UL compliant. We want to be one of the most versatile printers in the industry,because we strive to provide full service custom printing solutions, from tiny, tamper-evident labels to over-sized trade show banners, and from metal name plates designed to outlast the aircraft on which they are fastened, to the company shirt of the person who fastened it. CNC (computer numerical control) machining. We are happy to explain our processes, to enumerate the advantages and disadvantages of each methodology, and to answer any of your questions. Please call us at 800-639-4316, and allow us to help you select the best processes for your project.